Bob Warner is Director, Pacific Research Partnerships at Crawford School of Public Policy. Dr Philipp Krause gives this public talk titled ‘Finance ministries and development’. The importance of aid donor countries not imposing solutions or ‘best practice’ on recipient countries was the focus of two recent Crawford School events. In a public lecture at the School on February 11, Dr Philipp Krause from the Overseas Development Institute’s Centre for Aid and Public Expenditures looked at recent research on the roles of Finance Ministries and public finance management (PFM) systems in development (video available here). His talk discussed the very significant levels of financial support that donors are giving to reforms of public finance systems in developing countries, and the extent to which this support was focused in assisting governments to develop best practice systems — and posed some searching questions as to whether all of this effort was well directed. Krause pointed out that: the ‘best practice’ systems observed in OECD countries coevolved over a long period of time with other institutions and functions of the state, that facilitating development was typically not a key driver of many of the recent developments in PFM systems in these countries, and that some of the best governed OECD countries manage without many of the features of PFM systems that donors are encouraging developing countries to adopt. Krause argued that support for PFM systems should stop focusing on trying to instil ‘best practice’ and focus more on what is useful in specific country contexts and is consistent with the domestic political economy of public finance and with local capacity. 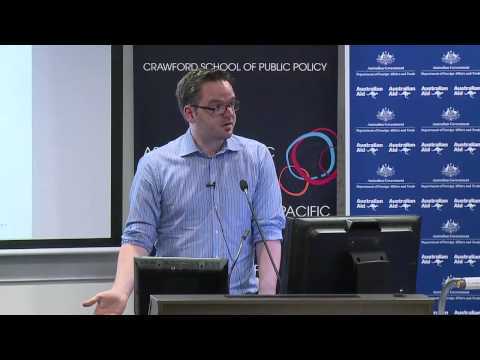 These themes were explored in more depth at a symposium in Suva held in collaboration between the Pacific Islands Centre for Public Administration and Crawford School’s Asia and the Pacific Policy Studies Society. The symposium brought together senior officials from finance ministries and central banks from Fiji Islands, Samoa, Solomon Islands, Tonga and Vanuatu, staff of the IMF, World Bank, ADB, DFAT, NZ MFAT, the Pacific Financial Technical Assistance Centre, the Pacific Islands Forum Secretariat and the Secretariat of the Pacific Community. Symposium organiser Bob Warner, Director of Pacific Research Partnerships at Crawford School, said there was broad agreement at the event that many of the reforms supported by donors in the past had failed to deliver measurable development impacts. “Many of the officials commented that these reforms had underestimated (and in some cases exacerbated) binding capacity constraints faced by small Pacific countries,” he said. “Participants agreed that that focus should be much more on helping to make existing systems work, and much less on trying to introduce system changes that did not reflect political and capacity realities.